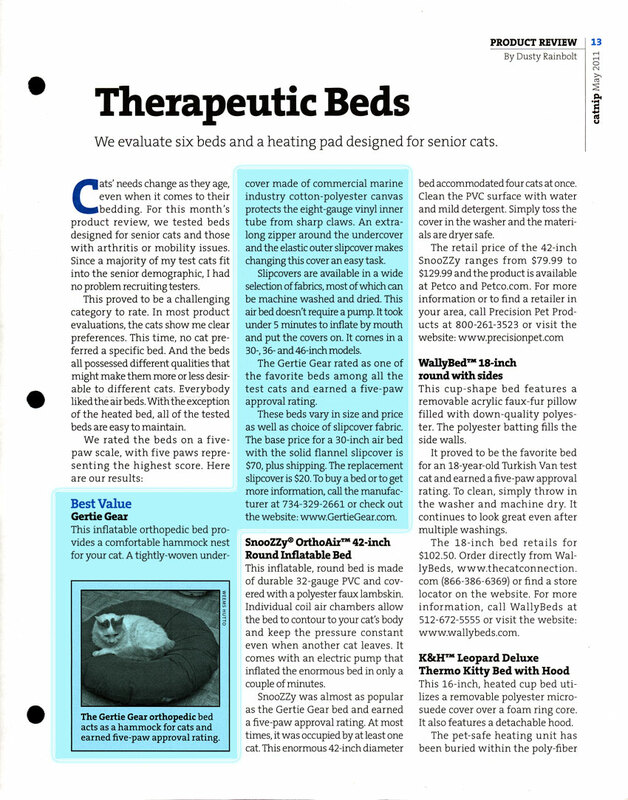 CATNIP magazine, The Newsletter for Caring Cat Owners, names Gertie Gear "BEST VALUE" among top 7 beds for senior cats and give it a FIVE PAW APPROVAL RATING. CLICK to download a PDF of the entire article. Author and product reviewer, Dusty Rainbolt writes regular articles for City+Country Pets, Whole Cat Journal and Catnip publications. She has won many awards for her writings from various publications and cat focused organizations. Dusty has written several books including: Kittens for Dummies, from the popular series. ©Catnip, May 2011 Vol. 19, No 5. Published by/for Cummings School of Veterinary Medicine at Tufts University.